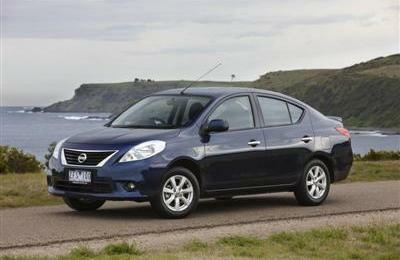 Nissan Australia has begun the renewal of its passenger car portfolio with the launch of the all-new Almera sedan. Almera is a light car that is big on space, comfort and value, priced from $16,990*. The Nissan Almera combines a distinctive exterior design, well-appointed interior and room for five adults – including enough rear legroom and boot space to embarrass some mid-size sedans. Almera complements the Micra hatch in the light car segment, with both models sharing Nissan’s global V-platform. Following Almera will be the return of Pulsar, led by Pulsar sedan in early 2013 and followed by Pulsar hatch mid-year. Nissan’s all-new Altima medium sized sedan then goes on sale in Australia in the second half of 2013. “The Almera provides sensational value with its spacious, comfortable interior and impressive equipment levels,” said Nissan Australia CEO William F Peffer Jr.
Almera features quality that exceeds the segment with roomy, comfortable cabin space in front and back seats in an affordable, fuel-efficient package. The Almera’s rear seat legroom (940 mm) is 94 mm greater than Hyundai Accent, 59 mm greater than Holden Barina and 36 mm greater than Toyota Yaris. The outstanding boot space (490 litres boot capacity) also sets the Almera apart from its sedan competitors in the light car segment. Boot space in the Almera is 25 litres greater than the Hyundai Accent and 15 litres more than the Toyota Yaris. 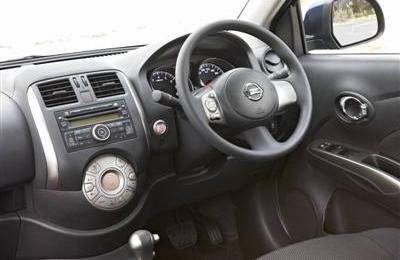 The long list of standard equipment in the Almera’s comfortable, modern interior includes Bluetooth hands-free phone system, steering wheel audio controls, central locking with remote keyless entry and four-speaker audio system with MP3 player auxiliary input jack. Almera Ti includes additional features such as rear park assist, climate control, intelligent keyless entry and push button engine start. The Multi-Function Drive Computer in the Nissan Almera puts all the necessary information at the driver’s fingertips, with display options for fuel consumption, remaining driving range and service reminder information. The Almera’s stylish and aerodynamic design features Nissan’s next generation sedan signature grille and large multi-reflector halogen headlights. Almera Ti offers 15-inch alloy wheels, fog lights and a rear spoiler. The Nissan Almera is available in six colours: Brilliant Silver, Burning Red, Deep Sapphire, Ebony, Titanium and White Diamond. The easy-to-drive Almera offers peace of mind with safety features including Vehicle Stability Control, ABS with Electronic Brakeforce Distribution and Brake Assist. Almera also includes the full complement of six airbags across all grades, with dual front, side and curtain airbags. The Almera’s four cylinder, 16-valve, 1.5-litre petrol engine provides 75 kilowatts power and 139 Nm torque, driven through the front wheels. The punchy, responsive engine is also efficient and economical, recording 6.3 L/100 km fuel use. Almera ST is equipped with a five speed manual transmission or a four speed automatic option. Sold as the Nissan Versa in the United States and as the Nissan Sunny in China, this model is a worldwide sales success.